Following the cancellation of the Run Falmouth Half Marathon and Kids Run 2018 we wanted to thank you again for your understanding. Unfortunately we must now confirm that we are unable to run either the Run Falmouth Half Marathon or Kids Run this year. A full Cornwall Hospice Care event calendar, high demand on our resources and the multiple factors needed to bring together the two races mean we are unable reorganise these events for this year. Falmouth Road Runners are kindly inviting all runners, clubs and individuals to a social run to complete what would have been the Run Falmouth Half Marathon course on Saturday 21st April at 9:00AM. Please be aware that as a social run, the facilities planned, i.e. water stations, registration, marshalling, first aid, hospitality, medals, road closures and course timings, etc. will not be in place. Please email clyden@cornwallhospice.co.uk with your full name, stating whether you are an affiliated, non-affiliated or Kids Run participant, and your bank account number, sort code and the name of your bank. Please email clyden@cornwallhospice.co.uk with your full name, the name of your online fundraising page, your bank account number, sort code and the name of your bank. The sponsorship refund will be issued to you as the fundraiser. We can’t send the money to each individual sponsor. Thank you to all those of you who have already contacted us via email and Facebook and offered to donate your registration fee and sponsorship to Cornwall Hospice Care. 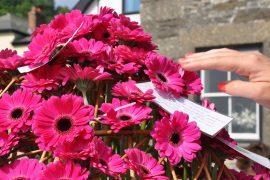 These generous gestures mean we can continue funding the care we offer terminally ill patients and their families across Cornwall. We look forward to delivering Run Falmouth 2019 and we hope to welcome you next year. If you have any other questions, you can call our Fundraising Office on 01726 66868 (option 3) Monday to Friday 8.30am to 4.30pm.